Nashik in Maharashtra produces the largest quantity of onions in the country. Wholesale prices there touched an yearly high of Rs 40 per kilogram last week. By the time it reached the main wholesale market in Navi Mumbai, the prices hit 50 to 55 rupees for a kilogram. Onion prices touched an yearly high last week going at almost Rs 80 a kilogram. Mumbai: Onions saw a spike in prices over the last two weeks and much of it has to do with what happens in Maharashtra and Lassalgaon where most of the onion grown in Nashik is traded and sent to different parts of the country. Prices have now fallen but are yet to stabilize. The volatility in prices, traders say, will continue till the end of this month and prices will go down to early November levels once the fresh stock arrives in the market. Onion prices had touched an yearly high last week going at almost Rs 80 a kilogram. This week, prices have come down to Rs 60 but likely to hover around 50 to 60 rupees till the end of December. The humble onion has seen a sharp spike in prices mostly due to the lack of supply. Traders at Mumbai's Dadar sabzi mandi or vegetable market say the trend is likely to continue till the end of this month because that's when the fresh stock will start arriving in the markets in full swing. 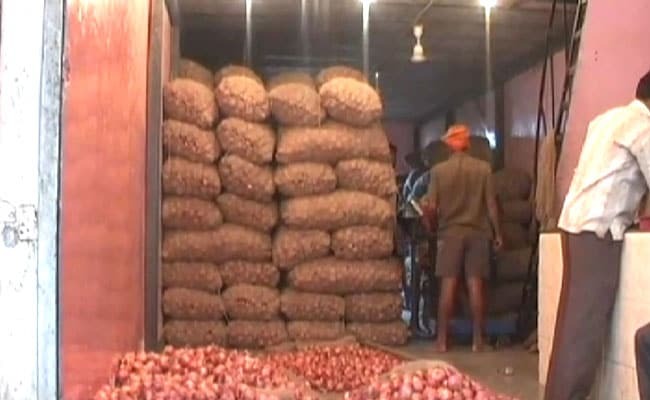 Ashok Varun, an onion Trader at a wholesale market in Navi Mumbai told NDTV, "Extra rainfall was witnessed after the monsoon months of June, July, August and September, a lot of onion crops were spoilt. Due to this, the crops which we usually start receiving during the time of Diwali were late." By the time it reaches the wholesale market at Dadar in Mumbai, prices reach Rs 60 to 70 for a kilogram and the consumer buys it from the retailer at Rs 80 a kilogram. Hiraman Pardeshi, an onion trader in Nashik, told NDTV, "Four days ago, in the district of Nashik the rates of onion were between Rs 2,000-4,000. Due to the increased rates of export duty the demand in the country has decreased and onion is not being exported." With the ban on export and the decision to import 2,000 tonnes of onion, consumers, however, will get some relief from the spike in prices the government hopes.